Fun 2B in First: Word Wall Freebie! I made some printables for my word wall. I am required to have one and I think they are great. Trying to add words can be a pain though and if you put all the words up at once, the kids have trouble using it. So, I decided to make a printable one and just write the words directly on it. I am including it as a freebie for you. Just click on the picture. 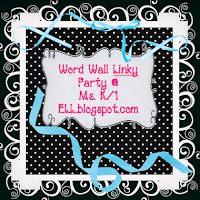 Check out the Word Wall Linky Party at Ms. M's Blog for more ideas. Thank You! I really don't have room for a big word wall. I will use these for a portable word wall!